Well – we’re halfway there… which is both terrifying and exciting at the same time! 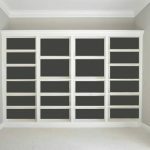 Week 3 of the One Room Challenge is an interesting space to be in – there is comfort in knowing we still have 3 weeks to go and the terror of the reality of the fact that we have 3 weeks to go and to-do list a mile long. This is also marks 2 weeks without a sink or stove and that my friends is NO FUN. 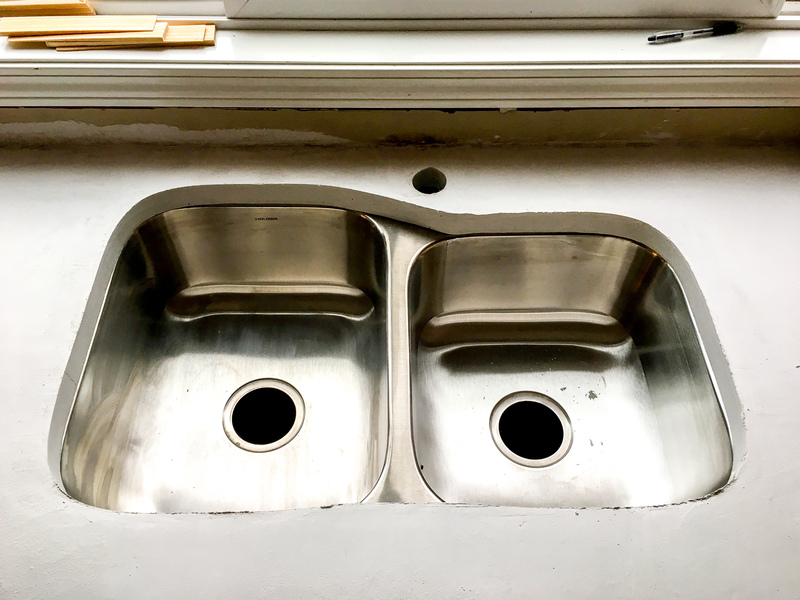 BUT – there is light at the end of the tunnel because we have a sink!! It’s not hooked up to plumbing and doesn’t have a faucet but hey – at least I have a piece of the counter puzzle back in place! Progress! 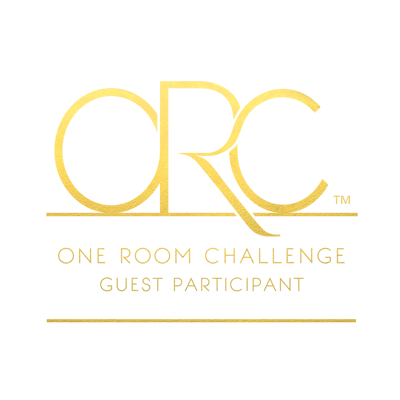 Let’s see how things are looking on this week 3 update! You can catch up with week one (before pics and the design plan) and week 2 here (DIY concrete counter progress). So I wish I could say the countertops are poured, sanded, and sealed but truth is they aren’t and this job h.a.r.d. Plus, there’s life going on around us like baseball-hockey-band practice and our regular jobs and unfortunately the universe didn’t get the memo we needed more hours in the day to get this kitchen done. But, it’s all good. We are making progress and we’ll get there! So the hardest part so far was pouring the long countertop in our kitchen with the sink. We decided to ditch the above mount stainless steel sink to go for a sleek undermount sink since we were ripping out the counters anyway. Of course I wanted a gold sink but the reality is I don’t have $1000 to spend on a sink so we opted for a traditional stainless sink and it was very reasonable from Home Depot. 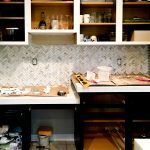 I LOVE the look of the white apron sinks but we would have had to cut into our cabinets and ain’t nobody got time for that. See how the sink isn’t just your average rectangle? Well – that proved to be quite the challenge for Mr. Wright! 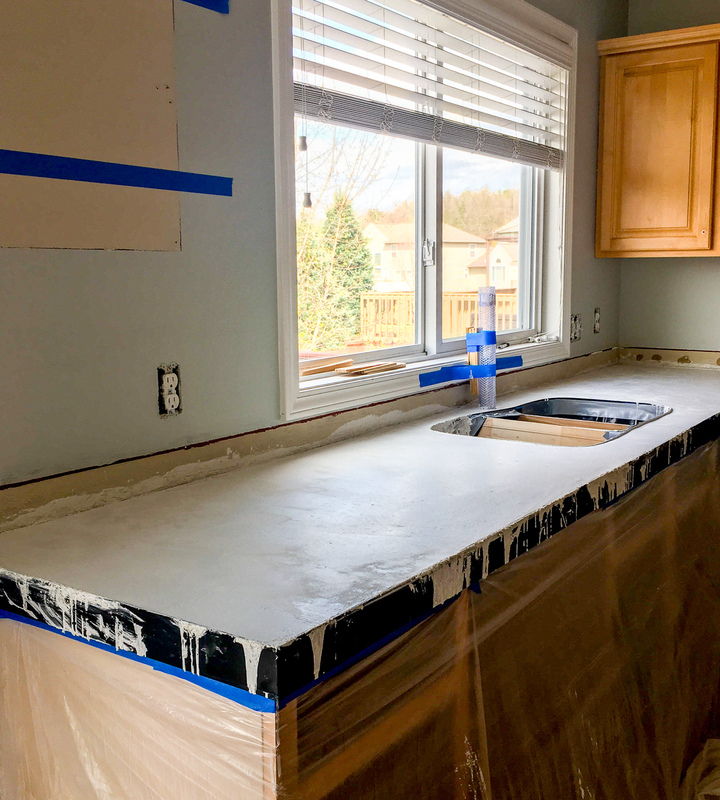 We ordered the sink form from Concrete Countertop solutions that molds around your sink so you can pour the concrete with the new sink in place. Well- problem with the fact that our sink didn’t have vertical walls – was that the plastic form had to be heated and molded to put around that oblong side. In hindsight, we should have just ordered a sink with straight vertical lines to make this process easier but hey live and learn right?! After many hours and lots of expletives he was able to have it formed with a combination of a blow dryer – duct tape – plastic wrap – blue painters tape – and old trim pieces. Here’s the sink area before! 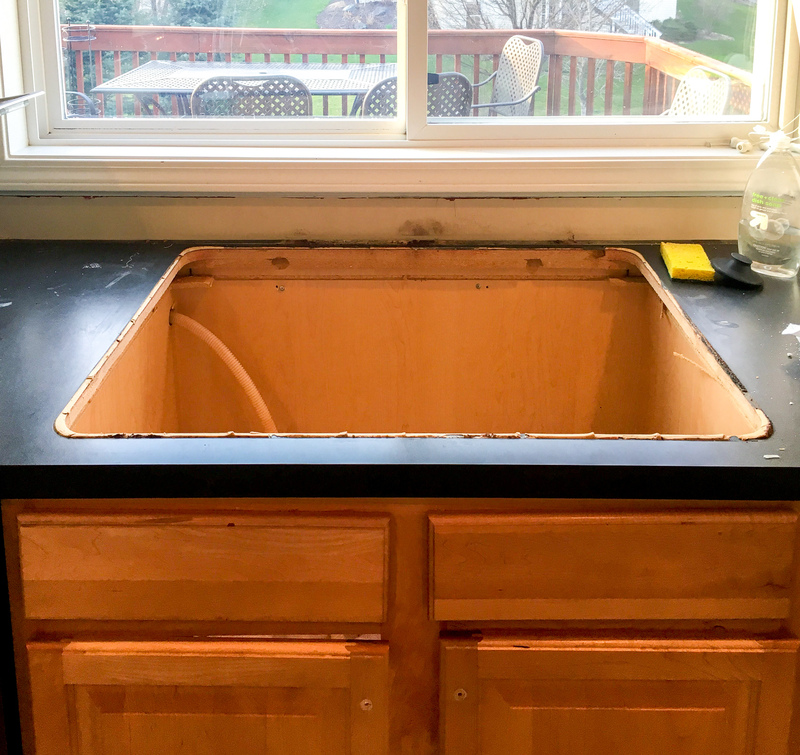 Countertop was removed and cement board added and then the sink area was cut out using the sink template that came with the sink. Our new sink was installed with the sink form around it in the cement board and siliconed in place. Then the mesh and clips were added just just like on the other countertops. And finally the cement was poured and we held our breath that concrete wouldn’t fall into the new sink! 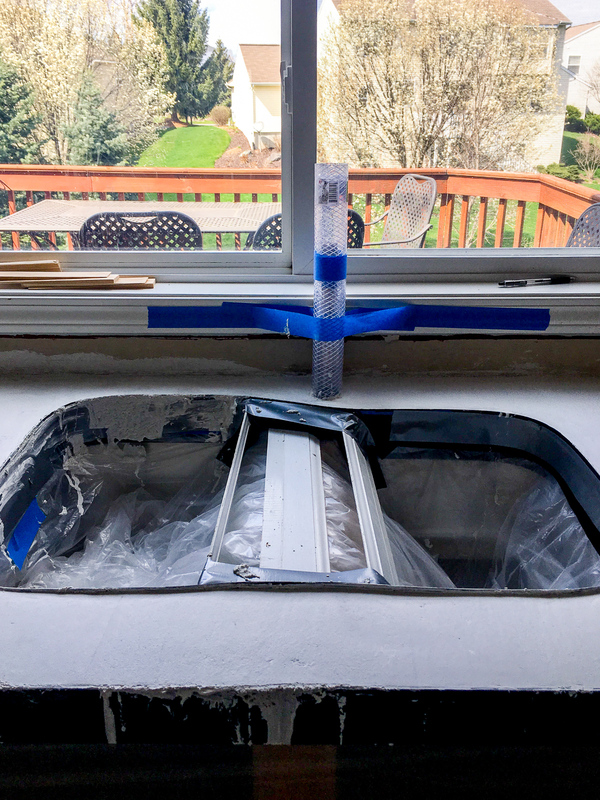 Update: A little concrete did seep into the new sink from the seem in the form that he duct taped together – he would have also put silicone there if he were to do it again. You may spy another interesting contraption behind the sink and we’ll get to that next! 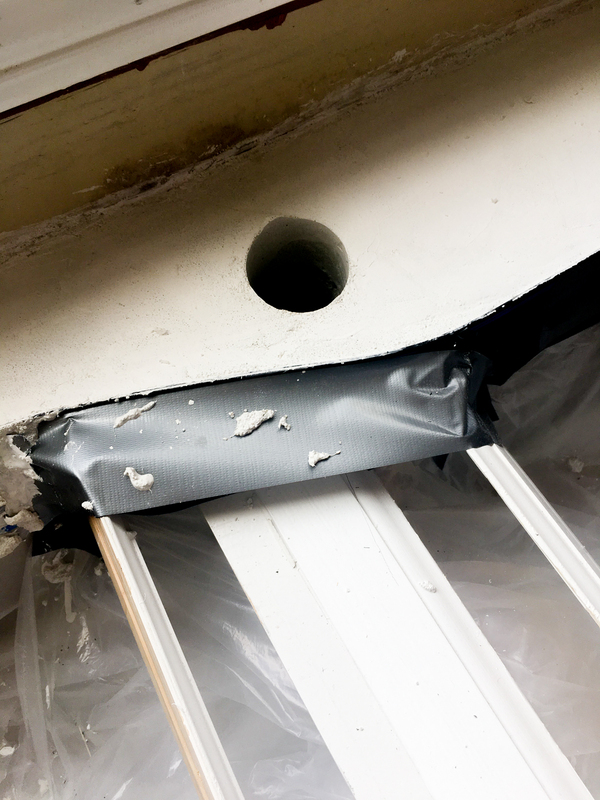 In order to have a place for the faucet there needs to be a hole in the cement board before you pour the concrete and concrete countertop solutions makes a faucet knock out just for that. Wouldn’t it be our luck though that our faucet is smaller than your average faucet? We needed a hole that was 2” in diameter so we had to find something at Home Depot that had that diameter and was flexible enough that we could remove it from the dry concrete. So enter the plumbing department and a braided vinyl tube for $6 – no clue what it’s actually used for but it worked! The Mr. drilled a hole in the cement board and siliconed this puppy in! 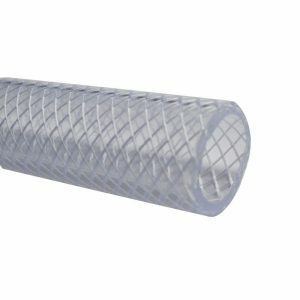 After the counter was poured and set for 24 hours the tube easily came out leaving us a perfect 2″ diameter hole – oh the things that excite us. Now mind you a lot of sanding needs to take place – BUT huge props to Mr. Wright for figuring that out! The next 3 weeks will be a mad dash of painting, installing the backsplash, and all the pretty things but I’m so excited! Also- Mike wanted me to let you all know he’s literally having nightmares about this getting done in time. Ha! 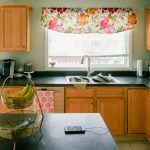 Thanks for following along with us and be sure to stop by and see all the other amazing room transformations here! 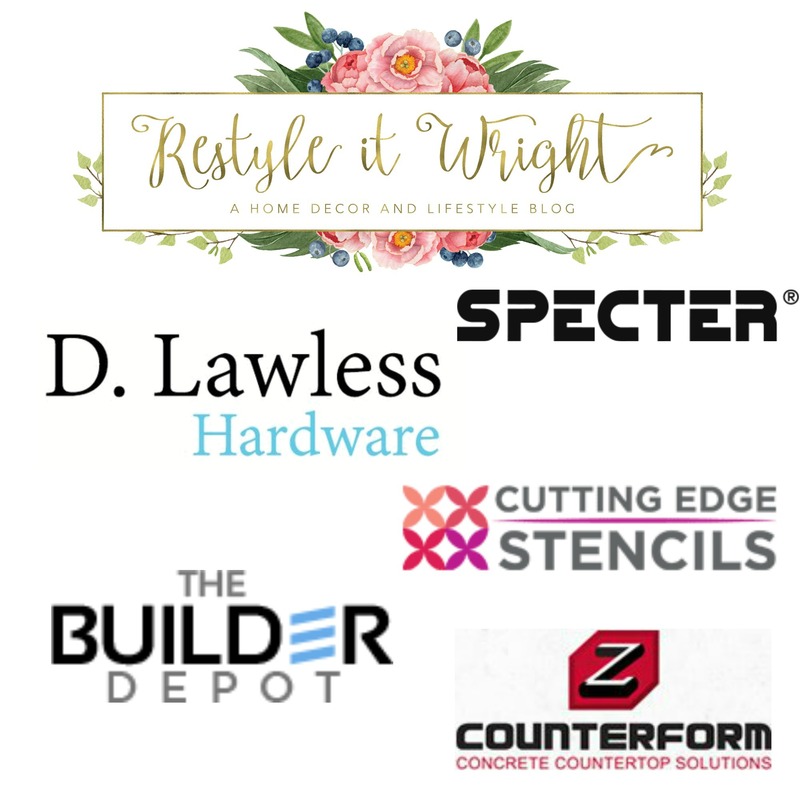 Huge thanks to Linda from Calling It Home and House Beautiful for hosting the challenge and to all my amazing sponsors! I’m so impressed with everything you guys are doing yourself! It’s going to look amazing and I’m sure you will be thrilled when it’s done! The undermount sink was totally the right choice, it looks amazing with the counters (even f they aren’t completely finished yet)! Poor Mike! He’s going to need therapy after all of this! Haha! Way to go! I don’t know if I have the guts to tackle concrete countertops but you guys did! AND you figured-out that sink situation. Good on you! haha Ariel – it’s definitely taken guts and a little but of insanity but we’re getting there! that is a tough job and i totally hear you on the regular life stuff, too. my kids are on break this week so i am pretty much on hold. Family is priority right Cassie?! Love the sink with the counters! This project is definitely on my to-do list. I played with concrete over the weekend and it was sooo much fun! Cool Emy! I’m hoping to take have some tips, do’s, and don’ts so it will be easier for you! I still can’t believe you guys are tackling this in 6 weeks! It looks like a pile of work, but you seem to be making a lot of progress! Can’t wait to see how it all turns out. Jessica – I know girl. We are INSANE. I love the sink! Good luck with sanding when it’s all cured! 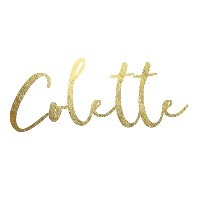 Impressive DIY you guys have done so far, Colette! Thank you!!! Sanding was a piece cake actually! Giiiiiirl you guys are crazy doing this kitchen haha. But those countertops are everything and so is that undermount sink. I can’t wait to see the finished counters!!! They’re looking great so far! 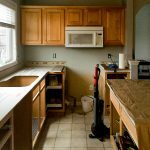 Wow, you’re brave to do your own concrete countertops! Everything is going to look lovely when you finish it. 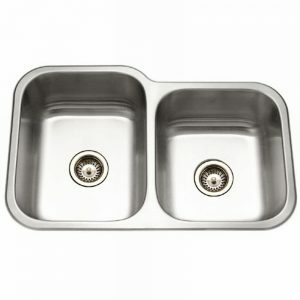 We have the same style of sink and I love how the one side is large enough to put in huge pans. You’ll love it! It looks BEAUTIFUL. I’m loving seeing your progress!